Midori performing in Myanmar along with Gahyun Cho, violin; William Frampton, viola; and Michael Katz, cello. World renowned violinist Midori has formed an international quartet with three gifted, young musicians to perform a series of concerts through the holiday season in Myanmar. 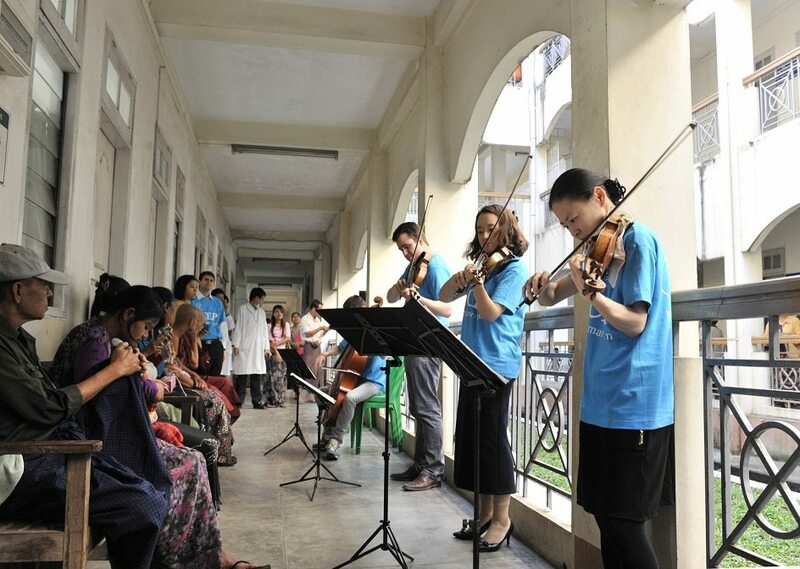 This travelling concert series is part of Midori’s International Community Engagement Program and aims to bring classical music to disadvantaged communities, connect these communities and the musicians, and raise awareness about the challenges poorer regions face in achieving the Millennium Development Goals. Midori’s quartet began a busy schedule in Yangon, and the tour included camps for internally displaced populations in Myitkyina on Christmas Eve and Day, health care centers and schools in Mandalay, and will wrap up with a Myanmar Peace Centre Concert on Sunday, December 29. Midori with patients at a hospital specializing in helping patients with cleft palates. Midori has been a United Nations Messenger of Peace since 2007, with a focus on Youth and the Millennium Development Goals. The United Nations is committed to supporting Myanmar in its efforts to address the country’s critical priorities of national reconstruction, political modernization and social harmony. Find out more about work underway there on the website on the UN Development Programme and the UN Department of Political Affairs.